A woman running late for her bus is sent flying through the air after she decided to leap in front of a Motorcycle. A woman was hit by a motorcycle in London after jumping into traffic to catch her bus. Miraculously, despite being sent flying along the pavement, she was completely unhurt and walked away uninjured. 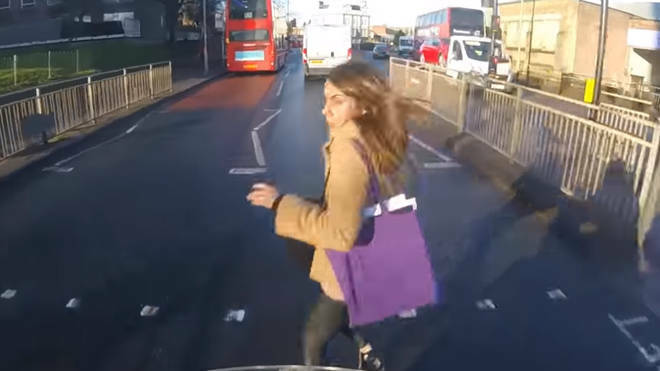 The terrifying Go-Pro footage from Twitter user Dax, known as @Aussiedax shows the nail-biting moment she left the pavement and proceeded to run across the road. Despite the traffic lights showing green, she decided to rick her chances. Unfortunately for our biker rider, he had very little time to react and had no choice but to ram the girl forward, sending her flying over the crossing. What is utterly astounding is the fact that the woman immediately picked herself up and continued to run off. She proceeded to tell our biker that she had to “run for her bus”. Meanwhile, Twitter user @Aussiedax is left to pick up his bike off the floor. The video has caused a lot of controversies online and has already hit thousands of views on social media under the title “Pedestrian 0, me also 0”. Click here if you want to see more motorcycle news articles.